The Blue Man I’ the Moss is a beautiful standing stone situated on Wheeldale Moor beside the route of the Lyke Wake Walk. In the past the stone has been painted blue, presumably as a guide for walkers. Today there is a painted cartoon of a man on the stone. The name originates from the Celtic word, Maen, a standing stone. Frank Elgee speculated that the Blue element of the stone’s name originates from the Cornish Plu meaning parish as the Blue Man acts as a parish boundary stone. The Moss element of the name is obvious to anyone who has walked over this part of Wheeldale, it can be extremely boggy. 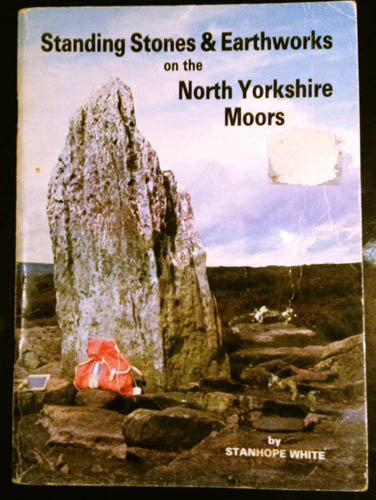 The Blue Man is pictured on the cover of Stanhope White’s booklet Standing Stones & Earthworks on the North Yorkshire Moors. Published in 1987 it is a useful little guide and can generally bought for a couple of pounds from second-hand booksellers. 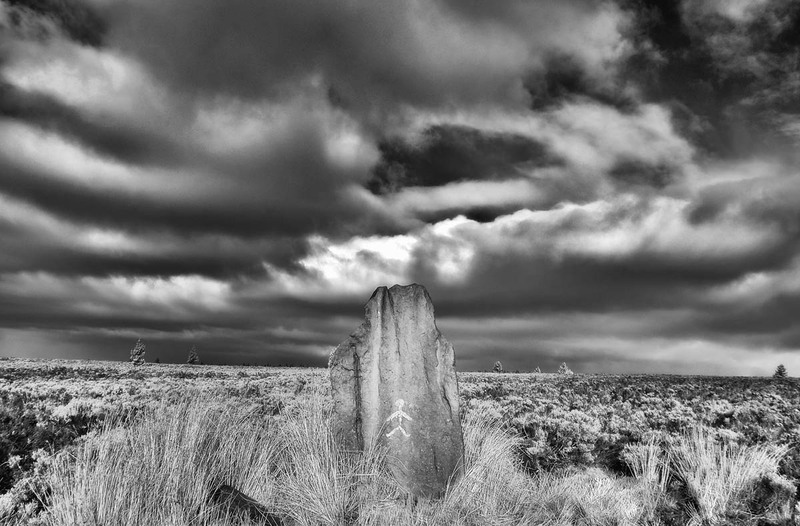 This Post was posted in Megalith, North York Moors, Prehistoric, Standing Stone, Wheeldale. Bookmark the permalink. The grammar is wrong the adjective follows the noun in Welsh so it would be maen plwyf, a Welsh acqaintance told me parish stone in Welsh is carreg plwyf. More likely to derive from old Danish bla meaning grey or lead coloured. Evidence for this is bluewath beck nearby, this clearly is not the parish beck, nor is Blue Bank the parish hill. Blawaths and blowaths abound on the moors, and grey or blackish is appropriate for all. Man does not derive from maen but is a usual metaphoric name in English for an upright stone (see any good dictionary)-this is found in other languages eg Gaelic-fhir duibhe on Ben Eighe means in English the Black Men. The original name was probably something like Bla Mand i Mos meaning the Grey( or( Lead Coloured )Stone in the Moss. In modern Danish Bly pronounced Blue still means lead. Also there is a grey stones hill by the Scarborough road near Hawsker so the idea is not unlikely. Thanks for your comments Anthony, the etymology of these places is really interesting and open to much speculation.